Not that that's stopped people from trying. Here are 10 fictional games that some totally demented people have tried to bring to life in the real world. 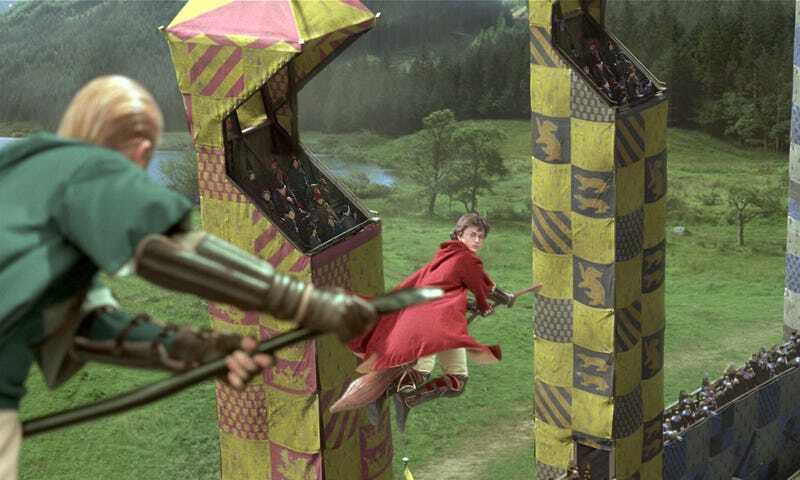 Perhaps the most famous of these examples is Quidditch from the Harry Potter books and movies. Born from Middlebury College hipsters in 2005, the sport has taken over at 300 universities as well as in 12 countries besides the U.S., according to the International Quidditch Association. The current champion from the Quidditch World Cup comes from, not surprisingly, Middlebury College. Not just satisfied by that, some are now even pushing for it to become an official high school sport. The future is bright for those random people you see in parks and college campuses who have brooms under their legs and are throwing balls at one another. The 1989 post-apocalyptic Australian film from David Webb Peoples, who was a screenwriter for Blade Runner, starred Rutger Hauer and revolved around the fictional sport know as The Game, which is played by Juggers. It involves two five-man teams attempting to put a dog skull on the opposing team's goalpost in a violent battle. Not surprisingly, people often die while playing it in the movie. The crazy Germans that brought the game to reality tweaked the rules so that there's not as much death, and have since inspired Americans, Australians, and others to take up the game. To skip the rules and watch the gameplay, go to 3:17. For many fans of Bill Watterson's Calvin and Hobbes, Calvinball seemed like the perfect game. It was a game designed for the imaginative and was always fun for all involved. But it also seemed impossible to play. This has not stopped many from psychotically trying to play a game designed for an eight-year-old and his tiger best friend. Of all the games on the list, this is easily the cheapest to play. It also may be the most maddeningly difficult. Called Triad in the original series, the handball and basketball crossover game known as Pyramid from Battlestar Galactica is a vital part of the universe. Similar to basketball, it can be played one-on-one or in teams and involves scoring by putting a ball through a goal on the pyramidal shaped court. However, the game has certain limitations on the player's movement and does allow for full contact. The game's lack of futuristic technology has made it fairly easy for people to replicate, and it actually looks like it could be fun. Patrick McGoohan's genius show had more than one insane element — few of which rivaled this martial arts game invented especially for the show. It involves two trampolines and a pool of water, which the two combatants attempt to throw their foe into. Although they couldn't get a pool of water, an intrepid group at the 2006 Burning Man festival did get two trampolines in order to kosho battle in the desert. Luckily, flickr photographer PrisonerCamp was there to take pictures of the madness. For six years, the "Death Guild" of San Franscisco have produced a Thunderdome at Burning Man. However, rather than the rules of two man enter, one man leave, it is actually: two men enter, get strapped onto bungy cords, and hit each other with nerf bats. This awesome event also turns into a dance club late enough at night. Apparently Burning Man is the place to be for more than just drum circles and hippies. Photo via Declan McCullagh. In the cult classic Tron and its sequel Tron: Legacy, the light cycle matches form some of the most memorable moments. In the 2010 sequel, the light cycles were redesigned to look sleeker and more modern. It was this version that Parker Brothers Choppers used to make their own working version. At just $55,000, the bike would be a steal — and if you can get two, then you could potentially challenge your friend to a game. Of course it would mean that one of you would presumably die, but still...light cycles! Cool! For many kids, Marty McFly was the coolest protagonist ever. Sweet car, cool style, and, most of all, he had a hoverboard. Screw skateboarding — hoverboarding is the only extreme, action sport that would be worthwhile. Although we're still a long way away from actually having a working model that can consistently carry a load, there have been some cool advances in creating one. Most notably, Nils Guadagnin built one in 2010 utilizing magnets. Despite the possibility of roaming hoverboard gangs, this technology needs to be more fully developed. There's a ton of problems with this movie. Everyone knows that. But the pod racing scene was still pretty cool and it allowed for Greg Proops to finally appear in the Star Wars universe. Now the pod racer is currently physically impossible to achieve, but that has not stopped people from doing their best attempts to make it work. This bizarre effort comes in 2009 and ends exactly as one would expect (skip to 1:35). Still, it's one small step in the right direction for the future of pod racing. Chess is a difficult and complicated game to begin with, but Star Trek's chess variant takes the game to a whole new plane with tri-dimensional chess. The game appears often in the franchise, and even is key in proving Kirk's innocence in the "Court Martial" episode of the original series. Although not set out by the show, rules were produced in 1976 and now you can even buy your own set to play for just 200 dollars.